Park Hill School District's Board of Education met Thursday evening, March 28. From a policy standpoint, the highlights of the agenda were: A "Demographic Profile" report projecting increasing enrollment resulting in a need for building new schools about eight years from now; A report on development of next year's budget projecting no change in property tax revenues, a slight increase in sales tax revenues, a slight increase in state funding and a $200,000 decrease in federal funding due to sequestration. ___________________________________________________ Read our Twitter feed for more education news from local, regional and national sources:http://twitter.com/#!/JW_Martinez ___________________________________________________ The KC Education Enterprise has a new sister site, KC Education Research Updates, with occasional news from researchers and neuroscientists of interest to educators. North Kansas City School District's Board of Education met Tuesday evening, March 26. From a policy standpoint, the highlight of the agenda was discussion of school bond and property tax levy issues. ___________________________________________________ Read our Twitter feed for more education news from local, regional and national sources:http://twitter.com/#!/JW_Martinez ___________________________________________________ The KC Education Enterprise has a new sister site, KC Education Research Updates, with occasional news from researchers and neuroscientists of interest to educators. Liberty School District's Board of Education met Monday evening, March 25. From a policy standpoint, the highlights of the agenda were: Proposed revision of district policy governing "School Board Ballot Issues" Unanimous approval of the Northland Advanced Career Studies Program "Memorandum of Understanding" and "By-Laws" A stadium committee report proposing a new $8 million stadium at Liberty High School to be shared with Liberty North A "Graduation Follow-Up Procedural Evaluation" showing that 81 percent of Class of 2012 graduates contacted are enrolled in traditional post-secondary institutions but only 38 percent "reported majoring or working in a career education field related to career education courses they studied in High School." Followup recommendations included: Continue to evaluate trends in typical career education fields to ensure career and technical education programs are addressing high needs that our students are interested in pursuing. Investigate the capabilities of the software program Naviance for developing four-year graduation plans with specific career interest areas. Also, investigate the accuracy of the graduate follow-up reporting available through Naviance to determine if it meets our needs to analyze data regarding our graduates beyond the 180-day mark. Adjust curriculum as needed to meet the changing demands of our students and the workplace. A federal sequestration update. According to the agenda: An estimated $149,873 of federal funding will be reduced next fiscal year as a result of the Federal Sequestration Order. A report on state funding. According to the agenda: The Department of Elementary and Secondary Education (DESE) currently indicates the funding level to be at a 92.710946 percent proration factor. The 7.29 percent reduction in funding means a loss of $3,636,464 for the District that will not be recouped. A report estimating a 28 percent enrollment increase over the next eight years. Information about financial constraints: LPS is currently out of bonding capacity due to rapid growth and low assessed valuation. LPS has the highest debt service $1.19, and total levy $6.09 of all peer districts in K.C. and St. Louis. LPS has the lowest assessed valuation per child of all peer districts in K.C. and St. Louis. Budget projections based on current economic conditions and growth projections for the next eight years show the district would need an additional local levy of more than $3.00 prior to FY21 to maintain current staffing and facility planning model. ___________________________________________________ Read our Twitter feed for more education news from local, regional and national sources:http://twitter.com/#!/JW_Martinez ___________________________________________________ The KC Education Enterprise has a new sister site, KC Education Research Updates, with occasional news from researchers and neuroscientists of interest to educators. Lee's Summit School District's Board of Education met Thursday evening, March 28. From a policy standpoint, the highlights of the agenda were: A legislative update; and Proposed revisions to a list of district policies on topics such as "School Board Ballot Issues," "District-Sponsored Instruction Options" and "Reporting and Investigating Child Abuse/Neglect." ___________________________________________________ Read our Twitter feed for more education news from local, regional and national sources:http://twitter.com/#!/JW_Martinez ___________________________________________________ The KC Education Enterprise has a new sister site, KC Education Research Updates, with occasional news from researchers and neuroscientists of interest to educators. Olathe School District's Board of Education met Monday evening, March 25. From a policy standpoint, the highlight of the agenda was unanimous approval of a resolution "authorizing and providing for the calling of a bond election in Unified School District No. 233, Johnson County, Kansas (Olathe) for the purpose of submitting to the qualified electors of the District the question of issuing General Obligation Bonds of the District in the amount of $244,800,000; authorizing the application to the State Board of Education for the authority to call said bond election; and providing for the giving of notice of said bond election." If approved by the Kansas State Board of Education, voting will take place Tuesday, June 11. ___________________________________________________ Read our Twitter feed for more education news from local, regional and national sources:http://twitter.com/#!/JW_Martinez ___________________________________________________ The KC Education Enterprise has a new sister site, KC Education Research Updates, with occasional news from researchers and neuroscientists of interest to educators. The Kansas City, Kansas School District's Board of Education met Tuesday evening, March 26. From a policy standpoint, the highlight of their agenda was considering proposed district policy revisions. According to the agenda: The Board approved the Superintendent's recommendation to engage the Kansas Association of School Boards (KASB) to conduct a comprehensive audit of the policies governing the school district's operation. The review took place over a period of twelve month [sic] and included examination of all policies and handbooks. "KASB is recommending a great many new policies for the board's consideration." The recommended changes to policy "both modernize and update to conform to changes in law, recent court decisions, and best education and management practices." (KASB October 2012) The Board began review of the recommendations of KASB at a special meeting on December 3, 2012. Under consideration during this meeting were revisions of policies governing: Agenda Duties of the Superintendent Search of Students Interrogation and Investigations Weapons Drug-Free Schools Bullying Gang Activity. ___________________________________________________ Read our Twitter feed for more education news from local, regional and national sources:http://twitter.com/#!/JW_Martinez ___________________________________________________ The KC Education Enterprise has a new sister site, KC Education Research Updates, with occasional news from researchers and neuroscientists of interest to educators. North Kansas City School District's Board of Education met Tuesday evening, March 19. From a policy standpoint, the highlights of their agenda were: Considered revising district policies governing "Professional Organizations" and "Community Use of District Facilities"; and Received a safety and security update. ___________________________________________________ Read our Twitter feed for more education news from local, regional and national sources:http://twitter.com/#!/JW_Martinez ___________________________________________________ Or you can sign up for a free subscription to the daily KC Education Enterprise roundup of local, state and national education news on paper.li: http://paper.li/JW_Martinez/1322883462 ___________________________________________________ The KC Education Enterprise has a new sister site, KC Education Research Updates, with occasional news from researchers and neuroscientists of interest to educators. Raytown School District's Board of Education met Monday evening, March 11. From a policy standpoint, the highlights of their agenda were: News that the district is featured in a chapter of a new book from Lead + Learn Press, Getting Started With Rigorous Curriculum Design; and A legislative update. ___________________________________________________ Read our Twitter feed for more education news from local, regional and national sources:http://twitter.com/#!/JW_Martinez ___________________________________________________ Or you can sign up for a free subscription to the daily KC Education Enterprise roundup of local, state and national education news on paper.li: http://paper.li/JW_Martinez/1322883462 ___________________________________________________ The KC Education Enterprise has a new sister site, KC Education Research Updates, with occasional news from researchers and neuroscientists of interest to educators. Grandview School District's Board of Education met Thursday evening, March 14. From a policy standpoint, the highlights of their agenda were: Announcement of the resignation of board member Bob Stewart; A report on estimated tax levies for 2013; and Considered revising district policies. ___________________________________________________ Read our Twitter feed for more education news from local, regional and national sources:http://twitter.com/#!/JW_Martinez ___________________________________________________ Or you can sign up for a free subscription to the daily KC Education Enterprise roundup of local, state and national education news on paper.li: http://paper.li/JW_Martinez/1322883462 ___________________________________________________ The KC Education Enterprise has a new sister site, KC Education Research Updates, with occasional news from researchers and neuroscientists of interest to educators. The Kansas City, Missouri School District's Board of Education met Wednesday evening, March 13. From a policy standpoint, the highlights of their agenda were: An update on the district's efforts to regain accreditation under the state's new Missouri School Improvement Program 5 (MSIP 5) requirements; A plan classifying schools as "Green, Yellow, or Red" and explaining improvement interventions based on each building's classification; An update on budgeting for the 2013-2014 academic year projecting decreases in state aid, revenues and expenditures. ___________________________________________________ Read our Twitter feed for more education news from local, regional and national sources:http://twitter.com/#!/JW_Martinez ___________________________________________________ Or you can sign up for a free subscription to the daily KC Education Enterprise roundup of local, state and national education news on paper.li: http://paper.li/JW_Martinez/1322883462 ___________________________________________________ The KC Education Enterprise has a new sister site, KC Education Research Updates, with occasional news from researchers and neuroscientists of interest to educators. Fort Osage School District's Board of Education met Tuesday evening, March 12. From a policy standpoint, the highlights of their agenda were: Considered approving revision of the district policy governing "Graduation Requirements"; Heard a report about the Missouri Highway Patrol's annual bus inspection; Heard a report about safety and security improvements; Heard a report about sequestration of federal funds for education; Received an update on proposed state legislation pertaining to education; Heard a report about refinancing existing school bond debt in order to save money for the district; and Discussed the possibility of scheduling a work session to review district student-restraint procedures. ___________________________________________________ Read our Twitter feed for more education news from local, regional and national sources:http://twitter.com/#!/JW_Martinez ___________________________________________________ Or you can sign up for a free subscription to the daily KC Education Enterprise roundup of local, state and national education news on paper.li: http://paper.li/JW_Martinez/1322883462 ___________________________________________________ The KC Education Enterprise has a new sister site, KC Education Research Updates, with occasional news from researchers and neuroscientists of interest to educators. 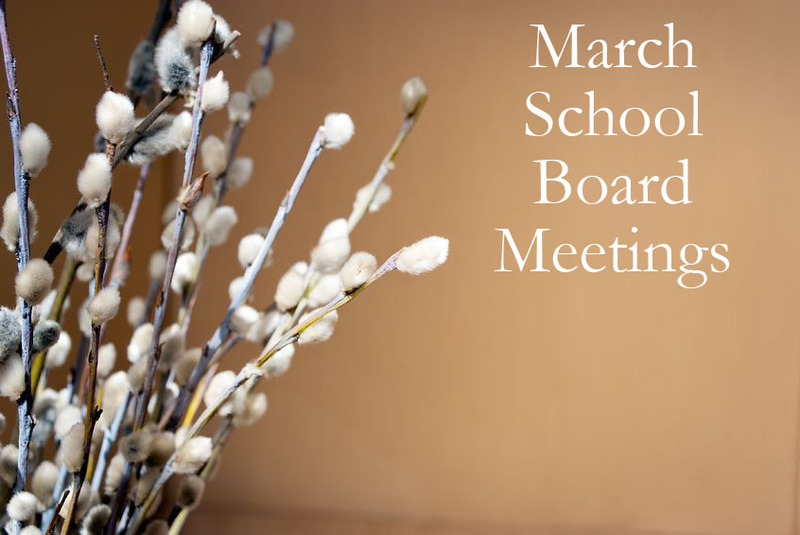 The Blue Springs School District Board of Education met Monday evening, March 11. From a policy standpoint, the highlights of their agenda were: A legislative update; and Commissioning four school officers. According to the agenda: In accordance with Missouri Revised Statute Section 162.215, the Blue Springs Board of Education is authorized to commission school officers to enforce laws relating to crimes committee on school premises, at school activities, and on school buses operating within the school district boundaries. It is recommended that the board take action to commission Blue Springs School District Safety Officers. ___________________________________________________ Read our Twitter feed for more education news from local, regional and national sources:http://twitter.com/#!/JW_Martinez ___________________________________________________ Or you can sign up for a free subscription to the daily KC Education Enterprise roundup of local, state and national education news on paper.li: http://paper.li/JW_Martinez/1322883462 ___________________________________________________ The KC Education Enterprise has a new sister site, KC Education Research Updates, with occasional news from researchers and neuroscientists of interest to educators. The Missouri State Board of Education met Monday, March 11. From a policy standpoint, the highlights of their agenda were: A report on education-related bills under consideration during the 2013 session of the Missouri General Assembly; An update on development of the budget for the 2014 fiscal year; and A study of proficiency-based learning (also referred to as competency-based or personalized learning). According to the agenda: As Missouri strives to reach the Top 10 performing states by 2020, there is need to look at the most promising practices to support the work of our schools. This may involve re-thinking how we structure schools, how we organize programs, and how we schedule and give credit for courses. ... Commissioner of Education, Chris Nicastro, initiated a task force in November of 2012 for the purpose of identifying barriers and developing recommendations for removing barriersto the implementation of proficiency-based learning by interested school districts. This report is presented to the Missouri State Board of Education to make clear the existing options that districts have, to provide guidance for initial implementation, and to recommend statutory and policy changes necessary to further support proficiency-based learning implementation. Proficiency-Based Learning (PBL) can be defined as: “Establishing the level of student learning through demonstration of knowledge and or skill without regard for the time taken in the learning process or the structure of delivery.” Important characteristics of Proficiency-Based Learning include: • Ideally, all students advance upon demonstrated mastery of content • Competencies include explicit, measurable, transferable learning objectives that empower students. • Assessment is meaningful and a positive learning experience for students. • Students receive timely, differentiated support based on their individual learning needs. • Learning outcomes emphasize competencies that include application and creation of knowledge, along with the development of important skills and dispositions. ... Some latitude already exists for districts to implement Proficiency-Based Learning. However, the degree to which schools can address the learning needs of students without being constrained by time is limited. Guidance and recommendations which would support further learner centered practices can be seen in two tiers or phases. These tiers can be generally conceptualized as changes made within the current time structure of schools (Tier I) and changes made in which both student and school schedules are much more flexible (Tier II). Specifically speaking, schools can provide greater flexibility for students’ learning needs without altering when students arrive or depart from school under a Tier I implementation. In Tier II, start and stop times might vary considerably. In addition, student schedules might be quite variable and might include times of “non-attendance” during the school day. With those understandings, the following guidance and recommendations are organized both by Tier and by hierarchy of change (practice, policy, statute). In both of these contexts, Tier I and Tier II, as with any other successful change implementation, the importance of local decision making and professional collaboration with all stakeholders, cannot be underestimated. The charge of the committee and consequent scope of recommendations concerns those barriers to implementation that exist at the state level. ___________________________________________________ Read our Twitter feed for more education news from local, regional and national sources:http://twitter.com/#!/JW_Martinez ___________________________________________________ Or you can sign up for a free subscription to the daily KC Education Enterprise roundup of local, state and national education news on paper.li: http://paper.li/JW_Martinez/1322883462 ___________________________________________________ The KC Education Enterprise has a new sister site, KC Education Research Updates, with occasional news from researchers and neuroscientists of interest to educators. Shawnee Mission School District's Board of Education met Monday evening, March 11. From a policy standpoint, the highlight of their agenda was voting unanimously to hire Independence School District Superintendent Jim Hinson as the new superintendent for the Shawnee Mission School District. ___________________________________________________ Read our Twitter feed for more education news from local, regional and national sources:http://twitter.com/#!/JW_Martinez ___________________________________________________ Or you can sign up for a free subscription to the daily KC Education Enterprise roundup of local, state and national education news on paper.li: http://paper.li/JW_Martinez/1322883462 ___________________________________________________ The KC Education Enterprise has a new sister site, KC Education Research Updates, with occasional news from researchers and neuroscientists of interest to educators. Piper School District's Board of Education met Monday evening, March 11. From a policy standpoint, the highlights of their agenda were: A report on implementation of the new national Common Core State Standards, which Kansas has adopted A report on plans to offer preschool to three-year-old district residents beginning next fall Considering a proposal to sponsor ten athletics and activities coaches through alternative funding sources such as Booster Club concessions and donations from the Piper Educational Foundation A report on plans to build a new high school using funds from sources other than property taxes. According to the agenda: Ideas are being developed to fund debt service for a new high school through alternative methods other than property tax. These ideas are being collaborated on with the WyCo Economic Development Office. A report on the refinancing of existing school bond debt -- intended to save money for the district -- which took place earlier this month. ___________________________________________________ Read our Twitter feed for more education news from local, regional and national sources:http://twitter.com/#!/JW_Martinez ___________________________________________________ Or you can sign up for a free subscription to the daily KC Education Enterprise roundup of local, state and national education news on paper.li: http://paper.li/JW_Martinez/1322883462 ___________________________________________________ The KC Education Enterprise has a new sister site, KC Education Research Updates, with occasional news from researchers and neuroscientists of interest to educators. Lansing School District's Board of Education met Monday evening, March 11. From a policy standpoint, the highlight of their agenda was a report on construction and design planning for the new high school. ___________________________________________________ Read our Twitter feed for more education news from local, regional and national sources:http://twitter.com/#!/JW_Martinez ___________________________________________________ Or you can sign up for a free subscription to the daily KC Education Enterprise roundup of local, state and national education news on paper.li: http://paper.li/JW_Martinez/1322883462 ___________________________________________________ The KC Education Enterprise has a new sister site, KC Education Research Updates, with occasional news from researchers and neuroscientists of interest to educators. The Kansas City, Kansas School District's Board of Education met Tuesday evening, March 12. From a policy standpoint, the highlights of their agenda were: A report on the district's Early Warning System. According to the agenda: The Kansas City, Kansas Public Schools has established a goal that "Each student will exit high school prepared for college and careers in a global society, and at every level, performance is on-track and on-time for success. To reach this goal, the district has created a District Continuous Improvement Plan (DCIP) which details what schools must do, to ensure that all students are on-track and on-time for success. In order to determine our success in reaching the goal, the Early Warning System is a tool with indicators that flag students who may need assistance to stay on-track and on-time for graduation. A report on the district's Standard Response Protocol. According to the agenda: The "I Love You Guys" Foundation is a non-profit organization and currently serves more than 400 schools across the country. The foundation developed the Standard Response Protocol in response to any type of school incident. The actions of the Standard Response Protocol are: Lockout, Lockdown, Shelter and Evacuate. ___________________________________________________ Read our Twitter feed for more education news from local, regional and national sources:http://twitter.com/#!/JW_Martinez ___________________________________________________ Or you can sign up for a free subscription to the daily KC Education Enterprise roundup of local, state and national education news on paper.li: http://paper.li/JW_Martinez/1322883462 ___________________________________________________ The KC Education Enterprise has a new sister site, KC Education Research Updates, with occasional news from researchers and neuroscientists of interest to educators. Gardner Edgerton School District's Board of Education met Monday evening, March 11. From a policy standpoint, the highlights of their agenda were: Unanimously approving a resolution to authorize the refinancing of existing school bond debt in order to save money for the district; Unanimously voting to approve new curriculum standards for language arts and math classes; and Unanimously voted to approve new district policies governing "Curriculum & Instruction" and "Administration." __________________________________________________ Read our Twitter feed for more education news from local, regional and national sources:http://twitter.com/#!/JW_Martinez ___________________________________________________ Or you can sign up for a free subscription to the daily KC Education Enterprise roundup of local, state and national education news on paper.li: http://paper.li/JW_Martinez/1322883462 ___________________________________________________ The KC Education Enterprise has a new sister site, KC Education Research Updates, with occasional news from researchers and neuroscientists of interest to educators. The Bonner Springs/Edwardsville School District's Board of Education met Monday evening, March 11. From a policy standpoint, the highlight of their agenda was an informational report from Leading Educators. Select teachers from participating districts serve two-year fellowships with that organization to develop their leadership skills with the goal of improving student learning. According to the Leading Educators website: This goal of the Fellowship is to decrease teacher attrition in high-needs schools and contribute to robust systems for impact at scale. __________________________________________________ Read our Twitter feed for more education news from local, regional and national sources:http://twitter.com/#!/JW_Martinez ___________________________________________________ Or you can sign up for a free subscription to the daily KC Education Enterprise roundup of local, state and national education news on paper.li: http://paper.li/JW_Martinez/1322883462 ___________________________________________________ The KC Education Enterprise has a new sister site, KC Education Research Updates, with occasional news from researchers and neuroscientists of interest to educators. Blue Valley School District's Board of Education met Monday evening, March 11. From a policy standpoint, the highlights of their agenda were: Filling a vacant position on the board by appointment. According to the district's Board Briefs for their March meeting: The Board appointed Stacy Obringer-Varhall to fill the vacant Northwest District Board of Education Position 5 through June 30, 2013. Obringer-Varhall is running unopposed for the same position in the April Board of Education election. The position opened when long-time Board of Education member Steve Klika resigned his position to take on a new role as a Johnson County Commissioner. Extending the contract of Superintendent Tom Trigg through the 2015-16 school year. ___________________________________________________ Read our Twitter feed for more education news from local, regional and national sources:http://twitter.com/#!/JW_Martinez ___________________________________________________ Or you can sign up for a free subscription to the daily KC Education Enterprise roundup of local, state and national education news on paper.li: http://paper.li/JW_Martinez/1322883462 ___________________________________________________ The KC Education Enterprise has a new sister site, KC Education Research Updates, with occasional news from researchers and neuroscientists of interest to educators. The Kansas State Board of Education met Tuesday, March 12. From a policy standpoint, the highlights of their agenda were: A report on proposed standards for history, government and social studies. A copy of the proposed standards is included in the agenda, which explains: The purpose of the document is to provide guidance to districts, schools, and teachers as they develop curriculum, units and lesson plans. The writing committee reviewed other state and national standards, researched best instructional practices, and gathered input from professionals and citizens in order to define what Kansas students should be able to know and to do in history, civics/government, geography, and economics. The committee responded to feedback on earlier versions throughout the current process. This revised document focuses on discipline-specific habits of mind that encourage the application of content in authentic situations rather than specific content, and is intended as a framework for curriculum, instruction, assessment, and teacher preparation. 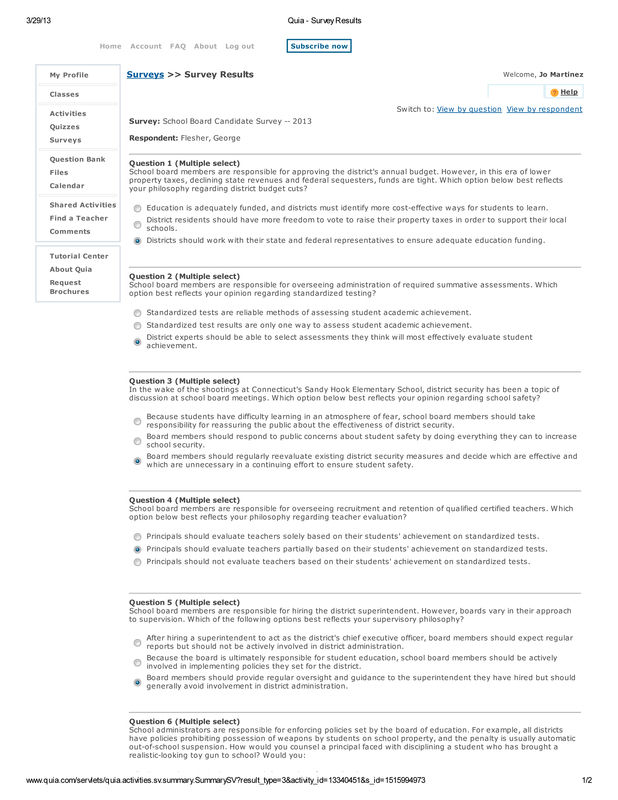 This document is designed to provide a uniform guide for instruction and is not intended to be a state-mandated curriculum for how and when content is taught. These decisions are left to local districts. The integration of knowledge drawn from distinct disciplines is an important consideration in learning. A concerted effort was made to address discipline-specific methods of thinking. The following Best Practices and Literacy Expectations section is included to encourage educators to address this type of disciplinary approach to learning. To prepare students to become effective twenty-first-century citizens requires more than a traditional knowledge of content. We must go beyond simple recitation of foundational information and instead encourage the application of that information in authentic and realistic situations. The practices and expectations reflect the Kansas College and Career Standards for English Language Arts & for Literacy in History/Social Studies, Science, and Technical Subjects and current research in discipline-specific best practices. Framed in the Benchmarks, these expectations exist in all grade levels and in increasing degrees of sophistication. Considered changing the way districts are required to test students' academic achievement in reading and math. Changes could come as soon as next year. An update on Kansas' participation in developing new national Next Generation Science Standards An update on proposed state legislation pertaining to education issues A budget report. You can view archived videos of this board meeting: http://www.ksde.org/Default.aspx?tabid=1958 ___________________________________________________ Read our Twitter feed for more education news from local, regional and national sources:http://twitter.com/#!/JW_Martinez ___________________________________________________ Or you can sign up for a free subscription to the daily KC Education Enterprise roundup of local, state and national education news on paper.li: http://paper.li/JW_Martinez/1322883462 ___________________________________________________ The KC Education Enterprise has a new sister site, KC Education Research Updates, with occasional news from researchers and neuroscientists of interest to educators. Basehor-Linwood School District's Board of Education met Monday evening, March 11. From a policy standpoint, the highlight of their agenda was considering saving money for the district by refinancing some existing school bond debt. ___________________________________________________ Read our Twitter feed for more education news from local, regional and national sources:http://twitter.com/#!/JW_Martinez ___________________________________________________ Or you can sign up for a free subscription to the daily KC Education Enterprise roundup of local, state and national education news on paper.li: http://paper.li/JW_Martinez/1322883462 ___________________________________________________ The KC Education Enterprise has a new sister site, KC Education Research Updates, with occasional news from researchers and neuroscientists of interest to educators. Not necessarily endorsing Leavingtolearn.org (don't know enough about them yet), but I think a lot of teenagers enrolled in public schools would identify with the message in this video: ___________________________________________________ Read our Twitter feed for more education news from local, regional and national sources:http://twitter.com/#!/JW_Martinez ___________________________________________________ Or you can sign up for a free subscription to the daily KC Education Enterprise roundup of local, state and national education news on paper.li: http://paper.li/JW_Martinez/1322883462 ___________________________________________________ The KC Education Enterprise has a new sister site, KC Education Research Updates, with occasional news from researchers and neuroscientists of interest to educators. Park School District's Board of Education met Thursday evening, March 7. From a policy standpoint, the highlights of their agenda were: Unanimously voting to approve revision of the district policy governing "Staff Conflict of Interest" Unanimously voting to allow district administrators to hire an outside agency -- SafePlans -- to provide a safety and security assessment of district schools Unanimously voting to approve the establishment a partnership between the Park Hill School District and the Northland Advanced Career Studies board of directors. According to the agenda: Northland Advanced Career Studies (ACS) is a program developed to serve the educational interests of students in Northland School Districts by developing partnerships between businesses/industries in our region and our Northland School Districts. These partnerships are being created in order to expand opportunities for students in the region to experience curriculum that is designed around business and industry standards and learning environments that are project based. ___________________________________________________ Read our Twitter feed for more education news from local, regional and national sources:http://twitter.com/#!/JW_Martinez ___________________________________________________ Or you can sign up for a free subscription to the daily KC Education Enterprise roundup of local, state and national education news on paper.li: http://paper.li/JW_Martinez/1322883462 ___________________________________________________ The KC Education Enterprise has a new sister site, KC Education Research Updates, with occasional news from researchers and neuroscientists of interest to educators. Liberty School District's Board of Education met Tuesday evening, March 5. From a policy standpoint, the highlight of their agenda was discussion of raising funds for a new high school stadium. ___________________________________________________ Read our Twitter feed for more education news from local, regional and national sources:http://twitter.com/#!/JW_Martinez ___________________________________________________ Or you can sign up for a free subscription to the daily KC Education Enterprise roundup of local, state and national education news on paper.li: http://paper.li/JW_Martinez/1322883462 ___________________________________________________ The KC Education Enterprise has a new sister site, KC Education Research Updates, with occasional news from researchers and neuroscientists of interest to educators. The Center School District's Board of Education meeting originally set for the last week of February was rescheduled for Monday evening, March 4. From a policy standpoint, the highlights of their agenda were: A recommendation to refinance some existing school bond debt in order to save money for the district; and Proposed revisions to a list of district policies and regulations governing topics such as "Surplus District Property," "Resignation of Professional Staff Members" and "Admission of Nonresident Students." ___________________________________________________ Read our Twitter feed for more education news from local, regional and national sources:http://twitter.com/#!/JW_Martinez ___________________________________________________ Or you can sign up for a free subscription to the daily KC Education Enterprise roundup of local, state and national education news on paper.li: http://paper.li/JW_Martinez/1322883462 ___________________________________________________ The KC Education Enterprise has a new sister site, KC Education Research Updates, with occasional news from researchers and neuroscientists of interest to educators. Olathe School District's Board of Education met Thursday evening, March 7. From a policy standpoint, the highlights of their agenda were: A presentation by representatives of the Bond Task Force 2013. According to the agenda: The Board of Education authorized continued study of the District's facility needs through the formation of a community and staff task force. Co-chairs, Mr. John Hutchison, Chief Financial and Operations Officer and Dr. Erin Dugan, Assistant Superintendent of General Administration, Mr. Shannon Wickliffe, Community Co-chair and 55 other members have served on Bond Task Force 2013. Five Sessions were held in the Board Room at the Education Center from 6-8 p.m. on January 22, February 5, February 12, February 19 and February 28. The goal of Bond Task Force 2013 was to bring a recommendation to the Board of Education at a the Board's March meeting for a future Bond to include projects outlined under four threads - growth, safety and security, technology and aging facilities. Voted unanimously to approve a resolution authorizing the sale of $17.5 million in school bond debt previously approved by district residents Voted unanimously to select Monday evening, March 25, as the date of a special meeting to place a proposed school bond issue on the ballot for next June. According to the agenda: The timing for this special meeting is driven by the calendar to comply with all requirements for a June 2013 election. Requirements include getting on the Kansas State Board of Education's agenda and meeting necessary timelines for the County Election Office. March 25, 2013 is the last date possible for a meeting to meet deadlines. Voted unanimously to approve boundary adjustments for Mahaffie and Washington Elementary Schools. ___________________________________________________ Read our Twitter feed for more education news from local, regional and national sources:http://twitter.com/#!/JW_Martinez ___________________________________________________ Or you can sign up for a free subscription to the daily KC Education Enterprise roundup of local, state and national education news on paper.li: http://paper.li/JW_Martinez/1322883462 ___________________________________________________ The KC Education Enterprise has a new sister site, KC Education Research Updates, with occasional news from researchers and neuroscientists of interest to educators. Raymore-Peculiar School District's Board of Education met Thursday evening, Feb. 28. From a policy standpoint, the highlight of their agenda was approval of revisions to the district policy governing "Audits." Board President Kim York cast the sole dissenting vote. According to a meeting update on the district's website: The board approved changing Policy DIE about Audits. The policy now states that the district’s selection of the independent auditor may be competitive bid every three years. The district is not required to bid the selection of the auditor. The board approved the change by a vote of 5-1, with Board President Kim York casting the dissenting vote. (Board member Kyle Gillespie was absent.) York shared concerns that the language could lead to the district keeping the same auditor for many years without seeking bids. She said she may propose a change to the Policy Review Committee. The board then awarded the newly approved three-year contract to Westbrook & Co. of Richmond, MO. ___________________________________________________ Read our Twitter feed for more education news from local, regional and national sources:http://twitter.com/#!/JW_Martinez ___________________________________________________ Or you can sign up for a free subscription to the daily KC Education Enterprise roundup of local, state and national education news on paper.li: http://paper.li/JW_Martinez/1322883462 ___________________________________________________ The KC Education Enterprise has a new sister site, KC Education Research Updates, with occasional news from researchers and neuroscientists of interest to educators. Platte School District's Board of Education met Thursday evening, Feb. 28. From a policy standpoint, the highlights of their agenda were: A report on how salaries in Platte County compare with those in other comparable area districts Voted unanimously to approve a "Forced Ranking Score Sheet Summary" for district administrators to use as a budget development tool. These guidelines prescribe cost savings through actions such as suspending summer painting, reducing field trips and eliminating activity buses. Voted unanimously to participate in the Northland Advanced Career Studies program A legislative update. ___________________________________________________ Read our Twitter feed for more education news from local, regional and national sources:http://twitter.com/#!/JW_Martinez ___________________________________________________ Or you can sign up for a free subscription to the daily KC Education Enterprise roundup of local, state and national education news on paper.li: http://paper.li/JW_Martinez/1322883462 ___________________________________________________ The KC Education Enterprise has a new sister site, KC Education Research Updates, with occasional news from researchers and neuroscientists of interest to educators. Park Hill School District's Board of Education met Thursday evening, Feb. 28. From a policy standpoint, the highlights of their agenda were: Proposed revision of the district policy governing "Staff Conflict of Interest" Hired a firm to provide a safety audit for all schools in the district Voted to participate in the Northland Advanced Career Studies program. According to the district communications director, Nicole Kirby: Superintendent Scott Springston said Park Hill will collaborate with Northland districts and businesses to better prepare students for college and careers. ___________________________________________________ Read our Twitter feed for more education news from local, regional and national sources:http://twitter.com/#!/JW_Martinez ___________________________________________________ Or you can sign up for a free subscription to the daily KC Education Enterprise roundup of local, state and national education news on paper.li: http://paper.li/JW_Martinez/1322883462 ___________________________________________________ The KC Education Enterprise has a new sister site, KC Education Research Updates, with occasional news from researchers and neuroscientists of interest to educators. North Kansas City School District's Board of Education met Thursday evening, Feb. 28. From a policy standpoint, the highlight of their agenda was unanimously voting to participate in the Northland Advanced Career Studies program. According to the agenda: The purpose of Northland ACS is to provide high-school students with hands-on, real-world work experience while enhancing workplace readiness skills. This innovative approach to education is designed to fully immerse students in a profession-based learning environment. Students will develop profession-based proficiencies by working in authentic business situations to develop meaningful projects. In addition, students will gain 21st century skills, including problem-solving, time- and project-management skills, business ethics and self-discipline. ___________________________________________________ Read our Twitter feed for more education news from local, regional and national sources:http://twitter.com/#!/JW_Martinez ___________________________________________________ Or you can sign up for a free subscription to the daily KC Education Enterprise roundup of local, state and national education news on paper.li: http://paper.li/JW_Martinez/1322883462 ___________________________________________________ The KC Education Enterprise has a new sister site, KC Education Research Updates, with occasional news from researchers and neuroscientists of interest to educators. Kansas City, Missouri School District's Board of Education met Wednesday evening, Feb. 27. From a policy standpoint, the highlight of their agenda was a unanimous vote approving changes to district policies governing "Policy Compliance." ___________________________________________________ Read our Twitter feed for more education news from local, regional and national sources:http://twitter.com/#!/JW_Martinez ___________________________________________________ Or you can sign up for a free subscription to the daily KC Education Enterprise roundup of local, state and national education news on paper.li: http://paper.li/JW_Martinez/1322883462 ___________________________________________________ The KC Education Enterprise has a new sister site, KC Education Research Updates, with occasional news from researchers and neuroscientists of interest to educators. Hickman Mills School District's Board of Education met Thursday evening, Feb. 28. From a policy standpoint, the highlights of their agenda were: A proposed contract with the Missouri School Boards' Association to audit the district's policies A report on proposed Tax Increment Financing (TIF) for redevelopment of the Bannister Mall site. According to the agenda: Of significance to the Hickman Mills C-1 School District is the inclusion within the agreement of a Neighborhood and Infrastructure Program. ... The fund may ultimately reach $8,000,000.00. Corrective Action Plan for recommendations made during the 2011-2012 fiscal audit Considered hiring a lobbyist The metal detector log sheet and police activity summary report. ___________________________________________________ Read our Twitter feed for more education news from local, regional and national sources:http://twitter.com/#!/JW_Martinez ___________________________________________________ Or you can sign up for a free subscription to the daily KC Education Enterprise roundup of local, state and national education news on paper.li: http://paper.li/JW_Martinez/1322883462 ___________________________________________________ The KC Education Enterprise has a new sister site, KC Education Research Updates, with occasional news from researchers and neuroscientists of interest to educators. Belton School District's Board of Education met Thursday evening, Feb. 28. From a policy standpoint, the highlights of their agenda were: A legislative update; A budget update; and A safety and security update. ___________________________________________________ Read our Twitter feed for more education news from local, regional and national sources:http://twitter.com/#!/JW_Martinez ___________________________________________________ Or you can sign up for a free subscription to the daily KC Education Enterprise roundup of local, state and national education news on paper.li: http://paper.li/JW_Martinez/1322883462 ___________________________________________________ The KC Education Enterprise has a new sister site, KC Education Research Updates, with occasional news from researchers and neuroscientists of interest to educators. The Kansas City, Kansas School District's Board of Education met Wednesday evening, Feb. 27. From a policy standpoint, the highlights of their agenda were: Considering signing an agreement to swap real estate with Community Housing of Wyandotte County to provide a new site for McKinley Elementary School. According to the agenda: Background McKinley elementary school continues to grow and the student population within the identified boundaries for the school is exceeding the schools capacity, resulting in students having to be bused to neighboring schools. In addition, the school was built in 1924 and no longer provides the space requirements for all aspects of school, including physical education, music and cafeteria services. The facility itself is simply not conducive for a 21st Century learning environment, and it is recommended that a new facility replace the existing school. Because it is a growing community, it is recommended that we continue to value the neighborhood school. Meaning that having the opportunity to build a school within the community that will meet the needs of students, parents and staff is imperative. Why it is important In working with Community Housing Wyandotte County (CHWC), they have a 2.5 acre piece of property approximately 1.5 blocks North of the existing school that is vacant and already has completed much of the grading work and preparation for construction. The agreement between CHWC and the Board would allow for the beginning of the construction of a new school in the area, no tax increase to our patrons, while at the same time allowing our students to continue to attend the existing school throughout the process. ... What action we want the Board to consider Approve the agreement with CHWC to exchange the two properties so that planning and development of a new school can begin immediately with an anticipated completion date of August 2014. Consideration of a low bid for demolishing Hazel Grove Elementary School. According to the agenda: Construction of the new Hazel Grove Elementary school is currently underway adjacent to the current school. Demolition is necessary to clear the old structure to make way for the bus loop, parking and required landscaping for the new building. ___________________________________________________ Read our Twitter feed for more education news from local, regional and national sources:http://twitter.com/#!/JW_Martinez ___________________________________________________ Or you can sign up for a free subscription to the daily KC Education Enterprise roundup of local, state and national education news on paper.li: http://paper.li/JW_Martinez/1322883462 ___________________________________________________ The KC Education Enterprise has a new sister site, KC Education Research Updates, with occasional news from researchers and neuroscientists of interest to educators. Liberty School District's Board of Education met Tuesday evening, Feb. 19. From a policy standpoint, the highlights of their agenda were: A report on Governor Jay Nixon's education budget for the coming year. According to the agenda: The State of Missouri Budget status has been released for the period July 2012 through January 2013 and overall net revenue is increased 9.5 percent compared to the same period of time last year. Currently, no change has been indicated to the state formula appropriation and the budget reflects a 7.32 percent reduction, in Liberty an estimated reduction in the amount of $3.7 million. The Governor has provided a budget recommendation for next fiscal year that includes an overall two percent increase in public education funding; however, the increase is limited to Classroom Trust Fund dollars that are dependent on gaming revenue increases. In the current year, gaming revenue taxes are falling short by four percent. A report on the district's operating budget revenues and expenditures. According to the agenda: The total revenue budget, including debt service and capital projects, is $127,299,911. The total expenditure budget, including debt service and capital projects, is $129,316,574. A report on a reduction in the School Funding Formula for the current school year, which is money per pupil the state of Missouri is required by law to pay each district. However, the formula has not been fully funded since the beginning of the Great Recession in 2009. According to the agenda: The 7.32 percent reduction in funding means a loss of $3,649,011 for the District that will not be recouped. A safety and security update. ___________________________________________________ Read our Twitter feed for more education news from local, regional and national sources:http://twitter.com/#!/JW_Martinez ___________________________________________________ Or you can sign up for a free subscription to the daily KC Education Enterprise roundup of local, state and national education news on paper.li: http://paper.li/JW_Martinez/1322883462 ___________________________________________________ The KC Education Enterprise has a new sister site, KC Education Research Updates, with occasional news from researchers and neuroscientists of interest to educators. The Missouri State Board of Education met Tuesday, Feb. 19. From a policy standpoint, the highlights of their agenda were: Unanimously elected Peter Hershend to serve as board president and Michael Jones to serve as vice president in the wake of the resignation of the former board president, Stan Archie Received a report about the state education department's collaboration with Pearson and ETS to develop new certification tests for teachers Received a report about bills relating to education under consideration by the Missouri General Assembly; Discussed state standards governing Educational Service Agencies (ESA's). According to the board's agenda: Any public school district or districts may designate an educational service agency (ESA), as defined in 20 U.S.C. Section 7801, for the purpose of developing, managing, and providing instructional service or programs to the participating school district or districts. The term ESA means a regional public multiservice agency authorized by State statute to develop, manage, and provide services or programs to local educational agencies. Voted unanimously to authorize publication or a notice of proposed rule making to amend Rule 20-600.110 relating to the Early Childhood Development Act. According to the agenda: The last substantive changes to the manual were made in 2010. Input has been received the Parents as Teachers Advisory Council and representatives from the Parents as Teachers national office. Revisions include: Encourage more frequent visits with families, especially high need families. Encourage programs to offer participating families with all four components of a Parents as Teachers Program. A change to the language to reflect the new curriculum being used. Voted unanimously to authorize publication of a notice of proposed rule making to adopt rule 5 CSR 20-400.125, which governs actions of the State Board of Education relating to applications for educator certificates. According to the agenda: The State Board of Education is authorized to grant educator certification in any of the public schools of the state and to establish requirements and qualifications for those certificates. This rule establishes procedures for review of applications of individuals convicted of a felony or crime involving moral turpitude, whether or not sentence is imposed; applicants whose license has been revoked in Missouri or in another jurisdiction; and applicants seeking to appeal a denial of license by the Office of Educator Quality. Voted unanimously to authorize publication of a notice of proposed rule making to adopt rule 5 CSR 20-100.260, which governs "Standards for Charter Sponsorship." According to the agenda: In November 2012, the State Board of Education approved the publication of a notice of proposed rulemaking to adopt 5 CSR 20-100.260 Standards for Charter Sponsorship. This notice of proposed rulemaking containing the text of the proposed rule was published in the Missouri Register on January 1, 2013(38 MoReg 99-104). The required thirty (30) day comment period ended on February 2, 2013. There were one hundred and one (101) comments received. ___________________________________________________ Read our Twitter feed for more education news from local, regional and national sources:http://twitter.com/#!/JW_Martinez ___________________________________________________ Or you can sign up for a free subscription to the daily KC Education Enterprise roundup of local, state and national education news on paper.li: http://paper.li/JW_Martinez/1322883462 ___________________________________________________ The KC Education Enterprise has a new sister site, KC Education Research Updates, with occasional news from researchers and neuroscientists of interest to educators. Turner School District's Board of Education met Tuesday evening, Feb. 19. From a policy standpoint, the highlight of their agenda was unanimously approving proposed revision of the district's policy governing "School Volunteers." ___________________________________________________ Read our Twitter feed for more education news from local, regional and national sources:http://twitter.com/#!/JW_Martinez ___________________________________________________ Or you can sign up for a free subscription to the daily KC Education Enterprise roundup of local, state and national education news on paper.li: http://paper.li/JW_Martinez/1322883462 ___________________________________________________ The KC Education Enterprise has a new sister site, KC Education Research Updates, with occasional news from researchers and neuroscientists of interest to educators. The Bonner Springs/Edwardsville School District's Board of Education met Tuesday evening, Feb. 19. From a policy standpoint, the highlight of their agenda was a safety and security update. ___________________________________________________ Read our Twitter feed for more education news from local, regional and national sources:http://twitter.com/#!/JW_Martinez ___________________________________________________ Or you can sign up for a free subscription to the daily KC Education Enterprise roundup of local, state and national education news on paper.li: http://paper.li/JW_Martinez/1322883462 ___________________________________________________ The KC Education Enterprise has a new sister site, KC Education Research Updates, with occasional news from researchers and neuroscientists of interest to educators. Raytown School District's Board of Education met Monday evening, Feb. 11. From a policy standpoint, the highlights of their agenda were: Considered approving an agreement with Glorioso Resources LLC. According to the agenda, the agreement is intended to: ... develop a strategic plan to aid the Raytown School District in achieving its goal of securing the highest amount of funds possible from the TiF project commonly referred to here as the Winchester Road development plan. In addition, a collateral goal is to secure funds from the Blue Ridge Mall TiF project. As part of this planning process Glorioso will assist the Superintendent, his staff, Raytown School Board members, and attorneys to better understand the inner workings of the City of Kansas City, Missouri's City Hall politics and process. Received a report on district energy savings Received a legislative update Received information regarding the Missouri School Boards' Association Legislative Forum scheduled for Tuesday, Feb. 19, in Jefferson City Received a report on the Winchester Tax Increment Financing Plan Received an analysis of the costs of placing additional armed guards in schools Considered approving the district's audit for the 2012 fiscal year. ___________________________________________________ Read our Twitter feed for more education news from local, regional and national sources:http://twitter.com/#!/JW_Martinez ___________________________________________________ Or you can sign up for a free subscription to the daily KC Education Enterprise roundup of local, state and national education news on paper.li: http://paper.li/JW_Martinez/1322883462 ___________________________________________________ The KC Education Enterprise has a new sister site, KC Education Research Updates, with occasional news from researchers and neuroscientists of interest to educators. Park Hill School District's Board of Education met Thursday evening, Feb. 14. From a policy standpoint, the highlight of their agenda was considering proposed revision of district policies governing a long list of topics such as "School Board Powers and Duties," "Board Member Removal From Office" and "School Attorney." ___________________________________________________ Read our Twitter feed for more education news from local, regional and national sources:http://twitter.com/#!/JW_Martinez ___________________________________________________ Or you can sign up for a free subscription to the daily KC Education Enterprise roundup of local, state and national education news on paper.li: http://paper.li/JW_Martinez/1322883462 ___________________________________________________ The KC Education Enterprise has a new sister site, KC Education Research Updates, with occasional news from researchers and neuroscientists of interest to educators. North Kansas City School District's Board of Education met Tuesday evening, Feb. 12. From a policy standpoint, the highlights of their agenda were: Voted unanimously to approve proposed revisions to district policies governing "Administration of Medicine to Students" and "Graduation Requirements"; A legislative update; and A presentation and discussion of a proposal to ask voters to approve the sale of additional school bond debt to help the district expand to meet the needs of growing enrollment. According the agenda, the presentation was to be in three parts: First, Jade Liska and Kyle Elliott from Kansas City Missouri Planning and Development, will provide information on projected growth within our school district boundaries. They will discuss the First and Second Creek Watershed area as well as Shoal Creek Valley. We will have opportunities to ask questions at the conclusion of their presentation. Next, we will transition to our Middle Schools and briefly review their capacity and projected enrollment. We will focus on the RSP projections for school year 2016/2017. Finally, Kirk Horner from Hollis and Miller will present three Planning Options – one that addresses the “standard” sixth middle school, a second option that uses that same building as a K-8 school and a third option that creates a K-8 Campus. All three options will provide an immediate solution to our “northern” capacity/ enrollment challenges and all three options address a future Phase Two as our student growth continues. We will encourage questions following this presentation. ___________________________________________________ Read our Twitter feed for more education news from local, regional and national sources:http://twitter.com/#!/JW_Martinez ___________________________________________________ Or you can sign up for a free subscription to the daily KC Education Enterprise roundup of local, state and national education news on paper.li: http://paper.li/JW_Martinez/1322883462 ___________________________________________________ The KC Education Enterprise has a new sister site, KC Education Research Updates, with occasional news from researchers and neuroscientists of interest to educators. Lee's Summit School District's Board of Education met Thursday evening, Feb. 14. From a policy standpoint, the highlights of their agenda were: A report from a representative of Missouri's State Auditor's office, which has randomly selected the district to be audited this year; An update on the new Smarter Balanced Assessment Consortium tests, which will replace the Missouri Assessment Program (MAP) testing. According Superintendent David McGehee: As the state and nation move toward the formal adoption and implementation of the Common Core State Standards, two consortia have been working at the national level to create next generation assessments to assess the standards. The state of Missouri is a member of the SMARTER Balanced Assessment Consortium. SMARTER Balanced assessments will be in use in approximately 26 states across the nation beginning in the 2014-15 school year. In the state of Missouri, they will replace MAP testing at the elementary and middle school levels and will add two end-of-high-school exams at the secondary level. This spring the SMARTER Balanced Assessment Consortium is conducting its scientific pilot to evaluate potential test questions and to statistically norm the exams that will be given in 2014-15. Schools across the nation were randomly selected by the consortium to participate in the scientific pilot study based on finding balanced demographics in the pilot participant schools. Lee’s Summit R-7 has five elementary schools participating in the scientific pilot between March 14 and May 10 (Summit Pointe Elementary, Richardson Elementary, Cedar Creek Elementary, Meadow Lane Elementary, & Hazel Grove Elementary). Additionally, schools that were not selected had the option to voluntarily participate; Lee’s Summit R-7 has one elementary school (Greenwood Elementary) voluntarily participating. The students and district will not receive scores from these pilot exams. The benefit to participants is the experience for staff administering and students taking the exams in this new format. Next generation assessments are taken on the computer and include technology-enhanced test questions. Additionally, the next generation assessments and the Common Core State Standards require a higher level of synthesis and analysis than previous state assessments have required. The pilot participants plan to share their observations and experiences regarding this new format of testing with the nonparticipant building leaders so that R-7 can benefit as a whole from the pilot. ___________________________________________________ Read our Twitter feed for more education news from local, regional and national sources:http://twitter.com/#!/JW_Martinez ___________________________________________________ Or you can sign up for a free subscription to the daily KC Education Enterprise roundup of local, state and national education news on paper.li: http://paper.li/JW_Martinez/1322883462 ___________________________________________________ The KC Education Enterprise has a new sister site, KC Education Research Updates, with occasional news from researchers and neuroscientists of interest to educators. The Independence School District's Board of Education met Tuesday evening, Feb. 12. From a policy standpoint, the highlights of their agenda were: Considering approval of a proposed resolution to issue and deliver school bonds; Considering adjusting elementary school boundaries; Hearing a legislative update; and Hearing an update on the remaining projects to be funded by the sale of school bond debt previously approved by voters. ___________________________________________________ Read our Twitter feed for more education news from local, regional and national sources:http://twitter.com/#!/JW_Martinez ___________________________________________________ Or you can sign up for a free subscription to the daily KC Education Enterprise roundup of local, state and national education news on paper.li: http://paper.li/JW_Martinez/1322883462 ___________________________________________________ The KC Education Enterprise has a new sister site, KC Education Research Updates, with occasional news from researchers and neuroscientists of interest to educators. Grandview School District's Board of Education met Thursday evening, Feb. 14. From a policy standpoint, the highlights of their agenda were: Proposed revision of district policies; and A three-year budget forecast. ___________________________________________________ Read our Twitter feed for more education news from local, regional and national sources:http://twitter.com/#!/JW_Martinez ___________________________________________________ Or you can sign up for a free subscription to the daily KC Education Enterprise roundup of local, state and national education news on paper.li: http://paper.li/JW_Martinez/1322883462 ___________________________________________________ The KC Education Enterprise has a new sister site, KC Education Research Updates, with occasional news from researchers and neuroscientists of interest to educators. Fort Osage School District's Board of Education met Tuesday evening, Feb. 12. From a policy standpoint, the highlights of their agenda were: A safety and security update; A board election update; and Proposed revisions to district policy governing "Graduation Requirements." ___________________________________________________ Read our Twitter feed for more education news from local, regional and national sources:http://twitter.com/#!/JW_Martinez ___________________________________________________ Or you can sign up for a free subscription to the daily KC Education Enterprise roundup of local, state and national education news on paper.li: http://paper.li/JW_Martinez/1322883462 ___________________________________________________ The KC Education Enterprise has a new sister site, KC Education Research Updates, with occasional news from researchers and neuroscientists of interest to educators. Excelsior Springs School District's Board of Education met Monday evening, Feb. 11. From a policy standpoint, the highlight of their agenda was a report by Superintendent John Lacy regarding a records request the district received from two local residents. According to Missouri's Sunshine Law, public records of government entities -- such as public school districts -- "are to be open and available to the public for inspection and copying." Although the district declined to provide the requested information to the citizens, the information they requested appears to be contained in the superintendent's report, along with his reasons for denial. ___________________________________________________ Read our Twitter feed for more education news from local, regional and national sources:http://twitter.com/#!/JW_Martinez ___________________________________________________ Or you can sign up for a free subscription to the daily KC Education Enterprise roundup of local, state and national education news on paper.li: http://paper.li/JW_Martinez/1322883462 ___________________________________________________ The KC Education Enterprise has a new sister site, KC Education Research Updates, with occasional news from researchers and neuroscientists of interest to educators. Blue Springs School District's Board of Education met Monday evening, Feb. 11. From a policy standpoint, the highlights of their agenda were: Consideration of architectural design and construction firms recommended for work on projects that may be funded by $20 million school in bond debt on the April ballot; and, Considered approving proposed changes to the district's policy governing "Sale, Distribution, Use or Possession of Tobacco or Electronic Inhalers." ___________________________________________________ Read our Twitter feed for more education news from local, regional and national sources:http://twitter.com/#!/JW_Martinez ___________________________________________________ Or you can sign up for a free subscription to the daily KC Education Enterprise roundup of local, state and national education news on paper.li: http://paper.li/JW_Martinez/1322883462 ___________________________________________________ The KC Education Enterprise has a new sister site, KC Education Research Updates, with occasional news from researchers and neuroscientists of interest to educators. Spring Hill School District's Board of Education met Monday evening, Feb. 11. From a policy standpoint, the highlights of their agenda were: Voted unanimously to approve revision of the district's policy governing its Bloodborne Pathogen Exposure Control Plan. According to the agenda, the board added the following language to the policy: Students shall not handle or clean up any body fluids including blood. Unanimously approved the 2013-2014 School Resource Officer Agreement with the Johnson County Sheriff's Office. ___________________________________________________ Read our Twitter feed for more education news from local, regional and national sources:http://twitter.com/#!/JW_Martinez ___________________________________________________ Or you can sign up for a free subscription to the daily KC Education Enterprise roundup of local, state and national education news on paper.li: http://paper.li/JW_Martinez/1322883462 ___________________________________________________ The KC Education Enterprise has a new sister site, KC Education Research Updates, with occasional news from researchers and neuroscientists of interest to educators.